On floured surface, roll dough to 1/4-inch thickness. 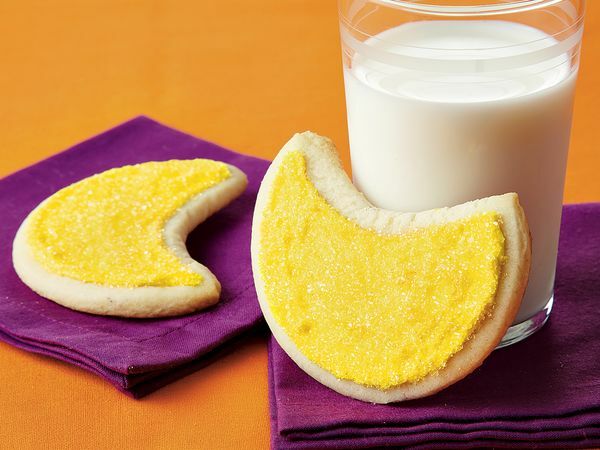 Cut with floured 3-inch crescent moon-shaped or round cookie cutter. On ungreased cookie sheet, place cutouts 1 inch apart. Reroll dough and cut additional cookies. Bake 10 to 12 minutes or until edges are lightly browned. Cool 5 minutes; remove from cookie sheet to cooling rack. Cool completely, about 20 minutes. Tint frosting with yellow food color. Frost cookies. Sprinkle with yellow sugar. Let stand until set. These festive treats can be easily turned into cookie pops. Just insert a paper lollipop stick into the base of each cookie before baking.